McCurlery’s Floor Center has been providing for Floor Muffler LVT Vinyl products for a few decades. We carry a wide verity of Marmoleum in addition to their accessories and there cleaning and maintains products. Our flooring installation crew knows how to install Floor Muffler and Marmoleum Flooring. The product that revolutionized the industry, The FloorMuffler is a Premium Grade, Patented, acoustic underlayment and moisture barrier for use in both residential and commercial installations. UltraSeal self sealing, overlapping lip and tape system allows for easy installation and seam protection. The product that revolutionized the industry, The FloorMuffler is a Premium Grade, Patented, acoustic underlayment and moisture barrier for use in both residential and commercial installations. Peel & Stik provides an adhesive backing for direct attach install. Our showroom in San Ramon & Concord, California shows many Floor Muffler and Marmoleum Flooring. 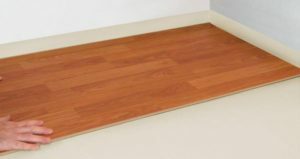 We offer the best Flooring selection at factory direct outlet pricing to the commercial and residential communities in the United States and all over the world.